Go here to see some other adorable ways to decorate and make creative valentine's with pictures of the people you love! Congrats on being featured! That's really cool, I'll have to go check it out next. these are absolutely adorable..only wish i had a little one to show off the cuteness! :) someday, there's always someday! thanks for sharing your little man with us! happy vday! Ah my goodness! That is seriously the cutest kid valentine ever. I am totally going to do that when we have kiddos...which (crossing fingers) isn't for a little while. :) I know the g-parents will love to see them! I love this! What kind of paint did you use? I wanna do this!! precious! wow, i really love these valentines. so creative & cute. congrats on being featured! you deserve it, loved the garland. You are by far the cutest mom I know! You are so creative and do such fun things with your family! I love how inspired I feel after reading your blog! OH, that's darling! LOVE it! soooo adorable :) I wish my little guy were older so we could do this...next year I guess! I love it! Brooks is the cutest little guy! omg you are REALLY good! amazing job! could you and Brooks be any cuter? I think not!!! WOW, I LOVE THESE! Do you think if I did my handprint on cards it would have the same effect? I love it! chubby little hand prints=best thing ever. Baby hands and hearts, can it get any better? Super cute project! So cute! How could you not be featured with all this cuteness! Love that chunky monkey...wish mine were still that little! I mean, really. Now I'm feeling sad about the store-bought ones I ordered for my fam. :( Boooo. These will mean so much to everyone...and they'll treasure them forever, I'm sure! That is so adorable! such a cute idea! He is just so so so so CUTE! That smile is just contagious! I hope you guys have a great valentines day on monday! oh my goodness, this is beyond adorable. so so so stinkin' cute. oh my gosh this is the cutest idea ever!! we tried to do the same thing with conrad and it was a disaster. super cute idea though huh? I am working on making a similar card, thanks for the idea! 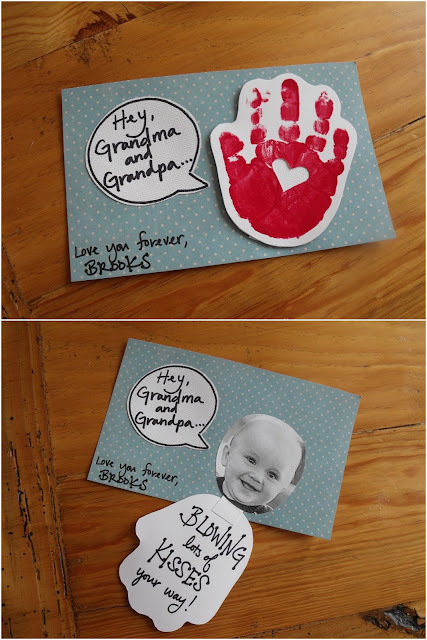 I have two boys so I put the big boy's hand on the outside and the little boy's hand on the inside, of a 5x7 card. Super cute! These are so stinkin' cute! Thank you so much for sharing. I made similar ones with my 2-year-old daughter this year, & it was so much fun. Hope your Valentine's Day is super special! Hello. I love this card! I was just wondering what you used to attach the hand to the card! Thanks! These are great! I want to do this with my little one this year. I'm a little confused about the little white heart cut-outs, though. Do you stick that on their hand after the paint so it leaves a white space when they make the handprint? That's what I was thinking, but for some reason it looks like there is a heart-shaped hole cut out of the handprint in the picture of the finished card. Hi I am also wondering what you used to attach the hand to card? Thanks! What did you use to attach the hand to the card? Thanks! SOOO CUTE! Since this is an older post, I'm not sure you'll respond, but I have two questions. 1 How did your make the white heart in the center of the handprint? Was it a paper punch out that you pasted on, or did punch out the heart from the handprint and backed the handprint with white paper to write the message ("blowing kisses your way"). 2. What did you use to attached the handprint to the card (and still have it like a flap)? It looks like you used a foam sticker. Thanks. This card is adorable! !